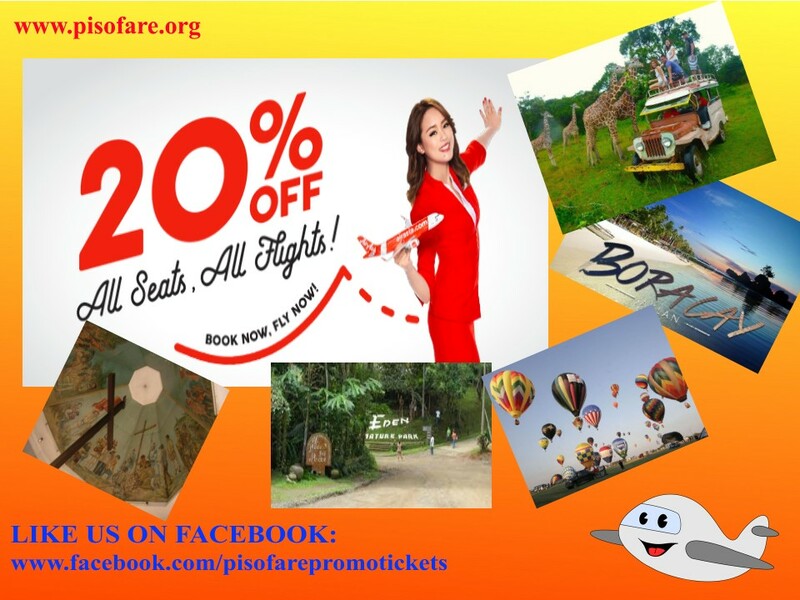 Piso Fare 2019 Promos Until 2020: Promo ticket up to 20% Off! Piso Fare Promo : This is the sale alert that we have been talking for days! We have until July 16, 2017 to book a promo ticket courtesy of the recently awarded low cost airline, AirAsia Ph. They are offering up to 20% off on plane fares. Fly from Manila to Cebu, Tacloban, Kota Kinabalu, Kuala Lumpur, and many more destinations and take advantage of this promo. Take note of the travel period is from July 17, 2017 to November 23, 2018 only. Here's a destination we suggest you take. Tagbilaran city in Bohol will have a colorful activity dubbed as the Sandugo Festival where you expect a lot of street drancing, beats of drum and lively music, colorful costumes and a showcase of great food from the Boholanos. The festival is held annually in honor of Bohol's great revered leader in his time, Datu Sikatuna. Below will show you some of the select routes where you can avail the promo within the duration. Aside from going to Tagbilaran in Bohol, you have an option to visit Davao, Caticlan where Boracay is or go international like Kota Kinabalu or Taipei. You have to really be patient when finding a promo fare especially that the seat sale is nearing its end. For those coming from the nearby provinces of Pampanga can take the Clark route and may not need to go to the main capital in Manila. The Clark airport will service routes to Boracay (via Kalibo) and Davao as well. Or course, you can still have the privilege to book a promo ticket up to 20% off. At least for now, this is the most affordable fare you can get with. Piso fare promos for 2018 is not yet available in any local airlines we have. Cebuanos may enjoy a good time to shop in Singapore during their huge Great Singapore Sale or GSS happening from July until August 2017. Of course, the 20% promo still applies to routes to the merlion city of Singapore. You can definitely tag along your closest friends to shop with you with your fave brands. Since you have saved some cash with your plane ticket, it means, you have more for a shopping spree! Taipei is also a great place for nice streetfoods and a shopping district as well. If you are ready to book your plane tickets, pls. refer here. Clicking the link will lead you to AirAsia's booking site.